This is a Traditional Sindhi dish prepared on auspecious occasions and festive days. 2. In a pan heat ghee / oil and add the cardamoms. 3. Add the rice and saute. Now pour one and half cups water. 4. When it starts boiling add a pinch of salt, saffron and let it cook until three-fourths done. 5. Now add the sugar. Stir it and let it cook on low flame. 6. Place the pot on a griddle and cover the lid well. Stir it carefully a couple of times until the water from the sugar is absorbed and the tehri is done. 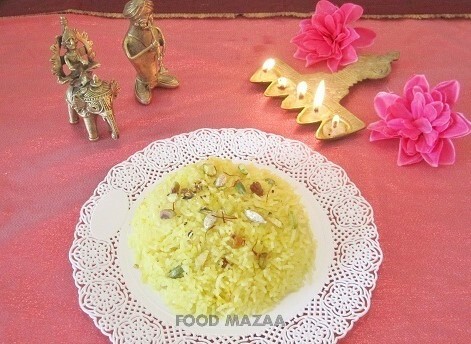 If you like soft tehri then sprinkle a little more water and place it for dum. 7. Heat a little ghee and pour over the tehri. Garnish with sliced pistachios and almonds. Delicious rice dear...i luv this...yum. Meena this salt tip is my grandma's .. she used to say it balances the sweetness. tehri ki shakal after so so long! and that too a royal one! How are you ? Here after a long time ! I love Teheri but never made it . Now will try .